“The days are surely coming…” A new church year begins with these five simple words from the prophet Jeremiah that open the first reading for this first Sunday of Advent. We enter this season knowing and expecting that “the days are surely coming”—busy days of Christmas preparation, full days of joyous celebration, wonder-full days of hope and promise. And yet this season reminds us that we have been waiting for the days to come for a long time. Generation after generation hungers for something more than even the joys of Christmas can bring us. “The days are surely coming…” The Advent longing of this season speaks to some of the deepest feelings within us: uncertainty, fear, sadness, despair, grief, pain, sorrow. Making it through to the joy of Christmas can be a balm for our spirits, but too often our need for something new reaches far beyond what we can know in a single day of celebration. A deeper, more complete transformation eludes us and our world. “The days are surely coming…” The hope and promise of Advent is more than confidence that we will survive the busyness of the holiday season, make it safely to our many travel destinations in these days, or even find new joy in Christmas this year. We journey beyond these things of this world in this season to wait, watch, and work for “the days that are surely coming” when transformation will take hold and the reign of Christ that we celebrated last Sunday will be visible in every place. “The days are surely coming…”So amidst everything else that fills this season, I hope and pray that you will make a little time to be about this deeper work of preparation for the days that are surely coming. Maybe this is a moment to discover new space in your own journey for living out God’s faith, hope, and love. Maybe this is the time to talk with leaders around you about sketching a strategy to participate in God’s work more fully in the coming year. Maybe this is the season to slow down just enough to mark the calendar for some of the opportunities coming in the year ahead that are outlined below. Maybe this is an opportunity to pray even more fervently for openness to the days that are surely coming for our world and our church. “The days are surely coming…”May today and every day ahead for you be filled with peace, love, joy, and hope, until this Christmas comes and until all things are made new in Jesus Christ. As we stand on the edge of another Holy Week, preparing to remember the journey of Jesus from his triumphal entry into Jerusalem through his arrest, trial, and execution and finally his resurrection, there’s something almost shocking to me about the intensity and speed of all these things. Just when things seemed to be at their highest point for Jesus, just when the man who had taught as he roamed the countryside reached the big city, just when he finally would be able to bring his proclamation of the kingdom of God to the halls of power, everything came crashing down in only a few days. Yet I think the intensity and speed at which the cries that greeted Jesus shifted from “Hosanna!” to “Crucify him!” makes the journey before us all the more compelling. These sorts of overnight shifts are all too familiar for us—maybe the friend who quickly goes from being in great health to suffering from terminal illness, or the colleague who is suddenly let go as the company’s priorities shift without warning, or the world situation that escalates almost overnight from order to massive chaos. In these moments as death seems to take hold, we experience the reality of Holy Week firsthand. But amidst all the darkness and death in our world, Holy Week also reminds us that death is not the end of the story. To paraphrase and extend the words of Martin Luther King, Jr., I believe that death does not drive out death—only resurrection can do that. The death of Jesus changed things once and for all, but that death would not have meant anything at all were it not for the resurrection. And so it is with us, that death will not change anything in our world, either—only living as resurrection people can do that. So as we remember this week the journey that Jesus first made from triumphal entry through execution and into resurrection, I pray that this journey might be real for us, too. I pray that we might see God walking with us in the pathways of darkness and death that stand before us so that we might live the new life of resurrection in our lives, in our churches, and in our world. Blessings on your journey this Holy Week and beyond! This afternoon, I will join with over 150 voices of the North Carolina Master Chorale to sing Johannes Brahms’ Ein deutsches Requiem. This is my first time to perform this beloved masterpiece, though I have heard recordings of it many times before over the years. This piece has a storied history of performance over the century and half since its composition, but I most remember the quickly-organized performance by the New York Philharmonic on September 20, 2001, in memory of the victims of the attack on the World Trade Center in New York City just nine days earlier. The text chosen by Brahms for Ein deutsches Requiem is not that of the traditional requiem mass but rather of biblical texts meant to offer comfort to the living. In these days of conflict and strife, words like these are all the more important to sing and share. Sometimes the words we sing and the music that makes them live are certainly enough, but today, in light of the dark clouds gathering around us, the walls being built to keep people from finding safety and hope, and the uncertainty of the coming days, I feel like I need to say a bit more about why I sing this piece today. Today I sing for family and friends who have died, for the gift of their lives in shaping mine, and for the memories that continue to flow. Today I sing for the victims of terrorism, on 9/11 and before and beyond, for those whose lives were cut short by violence of every sort. Today I sing for armed forces everywhere, for police officers and firefighters and EMTs, for those who work every day to protect us and lead us and guide us. Today I sing for government officials in my own nation and around the world who work for peace and goodwill and cooperation that sustains the fullness of life. Today I sing for those who long for peace, even a peace that looks different from what I have come envision through my own prayer and study. Today I sing for all who mourn death in so many ways, particularly those whose loved ones have been killed by injustice, terrorism, war, poverty, strife, and heartbreak. Today I sing for a Church that does its best to sing for others, even though it sometimes falls short, and for my own church that is not afraid to speak up for the vulnerable and oppressed. Today I sing for those who are afraid and allow themselves to live in fear, for those who have allowed violence to win the day by seeking vengeance, for those who seek something different but know no other way that the discord we have known and sown. Today I sing for refugees and displaced persons everywhere, for their immediate comfort and safety, for their longing to return home, for their hope of some way out of the difficult and challenging days that they face. Today I sing for those we are called to welcome as guests in our midst, for the stranger who knocks at our door, for the person on the side of the road who needs our help, and for those who reach out and respond in hope. Today I sing for people who have been singled out by the world as different in one way or another, for people of color, for LGBTQ persons, for immigrants and migrants, for Muslims and Jews and Christians, for all those who need to know that God loves them and need to feel that divine love expressed in human affection. Today I sing for my sisters and brothers who proclaim the gospel each and every day, whether they be Christian or Jewish or Muslim or other or claim no faith at all, whether they be ordained or not, whether they they use words or not. Today I sing for all those who show that God’s love cannot and will not be limited by any limit of our human minds. And today I sing for a new heaven and a new earth, as the little work I can do today to make a new and different way visible in the here and now, for the power of God to mold us and shape us and transform us and make us new. Wherever you are, however you raise your voice, I hope you will sing too. As we celebrated the birthday of Martin Luther King, Jr., last week, I decided that I wanted to do something more than just get a little extra rest or attack extra projects around the house. In light of the meaning of this holiday, I decided to do some reading, so I pulled out a book that might help me remember the origins of this holiday. At a meeting last fall, the Co-Moderators of our PCUSA General Assembly presented everyone in attendance with a copy of Debby Irving’s Waking Up White, a 2014 book that tells the story of the author’s journey of understanding how she herself fits in the story of race. Through personal stories and honest reflection, Irving, a white woman, describes how she came to understand that even some of her most well-meaning actions got in the way of not only real relationships with people of different races but also the sort of deeper transformation that is necessary to address the challenges of racism in our lives, our church, and our world. As I read Waking Up White on this MLK Day, I was challenged as I have been before and will be again to recognize the ways in which racism creeps into my life and work. I was heartened to learn that I am not alone in struggling with questions about how matters of race continue to need my attention. I appreciated learning more about how someone else had navigated these waters of learning and growth to be a deeper anti-racist presence. And I was grateful to read about some strategies that I can use to do this important work better. 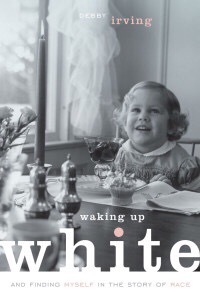 The Co-Moderators who initially shared this book with me and others at my meeting are inviting the whole Presbyterian Church (USA) to join in conversations about Waking Up White in an initiative they have titled “One Church One Book.” The Office of the General Assembly has prepared some resources to help the church use Waking Up White for conversations in congregational settings, including videos of the Co-Moderators discussing the book, a downloadable four-session study guide, and links to other resources. The author will also be speaking at the Progressive Youth Ministry Conference at Montreat in March. We believe that unity is, therefore, both a gift and an obligation for the church of Jesus Christ; that through the working of God’s Spirit it is a binding force, yet simultaneously a reality which must be earnestly pursued and sought: one which the people of God must continually be built up to attain; [and] that this unity must become visible so that the world may believe that separation, enmity and hatred between people and groups is sin which Christ has already conquered, and accordingly that anything which threatens this unity may have no place in the church and must be resisted. In these days, I hope and pray that we will all look for ways to have these sorts of difficult yet very important conversations in our churches so that we can work toward becoming the community of reconciliation, unity, and hope that God intends for our church. A few years ago, a college student named Andre Sanchez spent the better part of his Thanksgiving holiday waiting at the doors—not at the doors of his grandmother’s house for Thanksgiving dinner but rather at Best Buy, where he arrived at 1:00 on Tuesday afternoon before Thanksgiving so he could save some $600 on a couple electronics items when the store opened early on Friday morning. Afterward, he told a reporter, “When I finally got in, it felt like the gates of heaven opened up.” He was surely not alone—based on the sheer volume of advertisements via paper, email, and television these days, a great majority of Americans spent at least some part of the last few days shopping, and more than a few of them spent some time waiting at the doors. This is a season of waiting at the doors. Even if we did not wait to get into a big-box store on Thursday or Friday, I suspect that all of us are filled with some sort of waiting and expectation these days. We are waiting at the doors for the inauguration of a new president to bring an end to a brutally long campaign and election season. Here at Discovery, you are waiting at the doors to welcome your new interim pastor as he begins his work in your midst. And we are waiting at the doors of Christmas during this Advent season as we prepare our homes and our hearts to welcome Jesus. But what are we waiting for? What stands on the other side of the doors for us? Will the gates of heaven open to reveal a great Black Friday or Cyber Monday deal? Are we expecting a radical and dramatic change on January 21st after the inauguration? What are we asking and expecting of your new interim pastor Alan as he begins his work and service here? Most of all, are we ready for the dramatic and real change that comes among us when Jesus is born at Christmas? Our two texts this morning give us a glimpse of what awaits us on the other side of the doors of Christmas—a time well beyond Jesus’ birth, looking to his second coming in power and glory to make all things new, to the radical and dramatic shift that is made possible because God has been at work in our world in and through Jesus Christ. Our texts today give us a glimpse of what we are waiting for, not with visions of angels and shepherds and wise men but with a look well beyond Christmas Eve to a world that comes into being because of what God is doing in these days. Isaiah starts us out with a hopeful vision of peace and justice that shows us how things will look one day—not just on the other side of the gates of heaven as we wait for all things to be made new but “in the days to come” here on the earth, too. The prophet assures us that one day, God’s life in the world will be more evident and real. People everywhere will be drawn to God and look for God’s presence, not just in their own ways as they feel led, for their own individual benefit, but together, as many peoples joining as one, to seek instruction in how to live for the well-being of all. But these days to come are not just a time to sit around and enjoy something new—in this time, the word of the Lord will go forth to bring justice and peace to all the world, to “beat… swords into plowshares, and… spears into pruning hooks” so that the whole world will know the fullness of God’s presence and can live differently in light of this each and every day. Finally, if it weren’t already clear, the prophet invites everyone to join in this waiting and watching: “Come, let us walk in the light of the Lord!” All of us can prepare for these things ahead with hopefulness, doing our best to make this new way that awaits us on the other side of these gates real here and now. One way to think about this might be to adapt that wonderful old adage, “Jesus is coming—look busy!” While we need to be doing things to get ready for the days ahead, our busyness in these days needs to be real. We are called to be aware of what time it is, to turn away from the world’s pull upon us toward greed and consumption and to turn toward preparation and readiness. We are called to live like people who know what time it is, to deepen our practices of faith and to act to further the justice, peace, and reconciliation of our world along the way. An old Advent hymn puts it well, I think, when it asks, “O Lord, how shall I meet you?” How shall we get ready for the bigger changes ahead? How do we make this Advent season about something more than decorating our homes, completing our shopping lists, and meeting the world’s expectations of everything that must be done in the countdown to December 24th? How do we respond to the real divisions and challenges that are becoming more and more visible in our communities in light of the election? How do we make Discovery Church ready for the things that God has in store in and through your new interim pastor’s ministry but even more in the days beyond? In all these things and in all things, how do we set our lives in order to truly welcome Jesus? I don’t have any easy answers to these questions, but I do know this: As we wait at the doors of what God has in store for us as individuals, as the people of Discovery Church, and as citizens of the United States and our world, God calls us to remember that the things ahead will be dramatically and completely different. They cannot be described or contained in human words, for they hold a new, transformative way of life that begins by God’s own initiative. As we wait together here at these doors, we can remember that this promised transformation has happened once before—not through one announced with trumpets, attired in regal robes, living in a gold-gilt palace, or even elected by the people, but rather through one announced by angels to lowly field workers on the night shift, one wrapped in swaddling clothes, laying in a manger. And so the things we do as we wait at these doors ought to reflect the life of the one who brings new life, a way of justice and peace described by Isaiah that comes when our swords are beat into plowshares and our spears into pruning hooks, a way of radical expectation described by Jesus that insists that we be prepared to welcome the fullness of new life in God’s kingdom at any time, a way of hopeful waiting that comes when we remember the incredible gift of transformation in Jesus Christ that stands behind all real transformation in this world and the next. We will never know the reign of God that is in and among us until we wake up and become attuned to those promises of peace and justice, until we can become alert to those things that are going on around us that remind us of God’s presence, until we walk away from the cynicism and despair that can sedate us and become busy, working for a world where the downtrodden will be [lifted up] and the ravaged will be made whole. So may God open our eyes to the possibilities before us as we wait at the doors of God’s kingdom in our individual lives and in our life together in this place, may God help us to trust that our waiting at the doors will bring us something more than just temporal pleasures and seasonal highs, and may God show us how to look for the real joy and hope and new life that come as we walk in the light of the Lord.